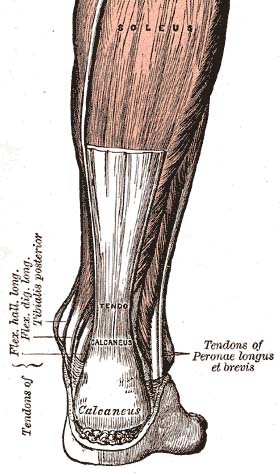 The gastrocnemius and soleus tendons merge to form the achilles tendon; the strongest in the human body. The National Institute for Health and Care Excellence describes achilles tendinopathy (AT) as an umbrella term for conditions causing degeneration of the achilles tendon. Although AT occurs in both male and female populations of all ages, the highest prevalence is among male recreational runners between the ages of 35-45 years old. AT is not always associated with vigorous physical exertion; Rolf and Movin analysed the history and clinical findings of 58 AT patients, of which 31% did not participate in sport or vigorous physical activity. The purpose of this modified systematic literature review is to explore the efficacy of eccentric exercise for the management of AT. Effectiveness will be determined by evaluating specific outcome measures, including changes in pain and changes in the disease specific Victorian Institute of Sport Assessment-Achilles Questionnaire (VISA-A). Robinson et al., found the eight questions in the VISA-A to have good test-retest (r=0.93), intra-rater (thee tests, r = 0.90), and inter-rater (r=0.90) reliability. Robinson et al., found the VISA –A questionnaire to have good construct validity, meaning that the assessment tool was able to distinguish between different severities. Hawker et al., evaluated the use of different outcome measures for pain, specifically the Visual Analogue Scale (VAS) and the Numerical Rating Pain Scale (NRPS). The VAS and NRPS are regarded as valid and reliable measurement tools in clinical practice. Hawker et al., found the VAS to have good reliability and highly comparable to a five point verbal descriptor measurement (“nil,” “mild,” “moderate,” “severe,” and “very severe”). Hawker and associates also found the NRPS to have high test-retest reliability and high validity compared to the VAS. Eccentric exercise is commonly used in conservative treatment of AT. This review will explore disparity between duration and frequency of eccentric exercise prescription and evaluate other treatment modalities used to treat AT. Wasielewski and Motsko carried out a systematic review to hypothesise the therapeutic efficacy of eccentric exercise for lower extremity tendinopathy. The authors used the Physiotherapy Evidence Database (PEDro) score to determine quality of eleven RCTs and found the mean score to be 5.4/10 with a range of four to seven. Wasielewski and Motsko argued that these scores are relatively good considering the maximum score achievable is eight, due to the inability to blind both the assessor and participant. However, the present researcher challenges this view, as high quality RCTs should be capable of blinding both participants and researcher. Allocation concealment and blinding of those involved, minimises the chance of individual perceptions causing bias. Wasielewski and Motsko found that pain was measured consistently, but strength was only assessed in 5 out of eleven trials. The authors concluded that eccentric exercise is likely to be a useful treatment adjunct, but could not conclude whether it is more or less effective than other therapeutic interventions. Woodley et al., carried out a systematic review into the effectiveness of eccentric exercise for tendinopathy of the achilles tendon, patella tendon and common extensor tendons of the wrist. Woodley et al., found few high quality studies and could not satisfy the proposal that eccentric exercise is more effective compared to other treatments. As with Wasielewski and Motsko , Woodley et al., did not look at the effects of eccentric exercise specifically on the achilles tendon. Existing literature suggests uncertainty to the most effective treatment for AT. Previous studies have suggested the recruitment of a larger number of participants and more valid and reliable outcome measures, with longer term follow-up. No previous studies have provided high quality statistically significant evidence to suggest eccentric exercise programmes are more effective than other adjunctive modalities. These reviews were published 6 years ago and therefore the present researcher aims to discover whether additional research in the form of high quality RCTs has been produced. This research is important because of the high incidence of AT, particularly in endurance runners, where the researchers experience has shown recovery to take months or even years. It is vital that the physiotherapy profession is providing effective treatment modalities to reduce complications and help individuals get back to their pre-injury state. All treatment that physiotherapists carry out should be supported by high quality evidence that upholds clinicians reasoning. The methodology consists of the study design, assessment of methodological quality, data collection and analysis of the included studies. A modified systematic literature review evaluating randomised controlled trials which compare conservative treatment or placebo, with eccentric exercise for treating AT. AMED. CINAHL Plus. Cochrane Library. Medline. NICE Clinical Knowledge Summaries (CKS), PEDro and SPORTDiscus. Table 1 - Inclusion and exclusion criteria for modified systematic literature review. ↑ Bressel E, McNair PJ. Biomechanical behavior of the plantar flexor muscle tendon unit after an Achilles tendon rupture. American Journal of Sports Medicine 2001; 29(3): 321–326. ↑ Alfredson H, Lorentzon R. Chronic Achilles tendinosis: recommendations for treatment and prevention. American Journal of Sports Medicine 2000; 29(2):135-46. ↑ Rolf C, Movin T. Etiology, histopathology, and outcome of surgery in achillodynia. Foot & ankle international 1997; 18(9): 565-9. ↑ 5.0 5.1 Robinson JM, Cook JL, Purdam C, Visentini PJ, Ross J, Maffulli N, Taunton JE, Khan KM. The VISA-A questionnaire: a valid and reliable index of the clinical severity of Achilles tendinopathy. British Journal of Sports Medicine 2001; 35: 335-341. ↑ 6.0 6.1 6.2 6.3 Hawker GA, Mian S, Kendzerska T, French M. Measures of Adult Pain. Arthritis Care & Research 2011; 63(11): 240-252. ↑ Meyer A, Tumilty S, Baxter GD. Eccentric exercise protocols for chronic non-insertional Achilles tendinopathy: how much is enough’. Scandinavian Journal of Medicine & Science in Sports 2009; 19(5): 609-15. ↑ 8.0 8.1 8.2 8.3 Wasielewski NJ, Kotsko KM. Does Eccentric Exercise Reduce Pain and Improve Strength in Physically Active Adults with Symptomatic Lower Extremity Tendinosis? A Systematic Review. Journal of Athletic Training 2007; 42(3): 408-421. ↑ de Morton NA. The PEDro scale is a valid measure of the methodological quality of clinical trials: a demographic study. Australian Journal of Physiotherapy 2009; 55(2): 129-33. ↑ Akobeng AK. Community child health, public health, and epidemiology: Understanding randomised controlled trials. Archives of Disease in Childhood 2005; 90(8): 840-844. ↑ 11.0 11.1 Woodley BL, Newsham-West RJ, Baxter GD. Chronic tendinopathy: effectiveness of eccentric exercise. British Journal of Sports Medicine 2007; 41(4): 188-198.